On June 5, 1947, as part of the American political strategy of containment vis-à-vis the Soviet Union, U.S. Secretary of State George C. Marshall delivered a speech at Harvard University in which he offered the countries of Europe an economic aid program to rebuild their national economies. Because the program did not yet have an official name, the press called it the Marshall Plan. On April 3, 1948, President Truman signed the Economic Cooperation Act, putting the European Recovery Program (ERP) – as the Marshall Plan was now officially called – into motion. The plan provided for approximately thirteen billion dollars in aid. 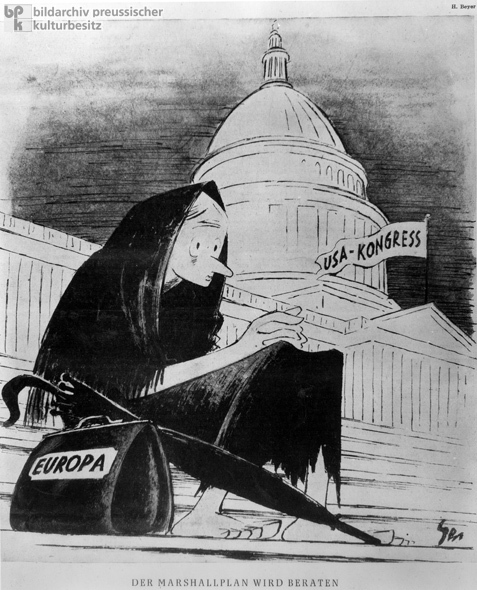 This caricature from Der Simpl, a satirical newspaper published in the American occupation zone, appeared in February 1948, two months before Truman signed the Economic Cooperation Act. Drawn by H. Beyer, the image shows "Europe" in the form of an impoverished, emaciated (and presumably widowed) woman in tattered black clothes. With a small bag, no shoes, and nothing more than an umbrella for protection, she sits on steps of the U.S. Capitol, where Congress is apparently in session. The caption at the bottom reads: "The Marshall Plan is being discussed."